You can select a restore point for the machines that you want to recover. By default, Veeam Backup & Replication uses the latest valid restore point to recover a machine. However, you can recover the machine to an earlier state. If you have chosen to recover several machines, you can select the necessary restore point for every machine in the list. In the Machines to restore list, select a machine. Click Point on the right. 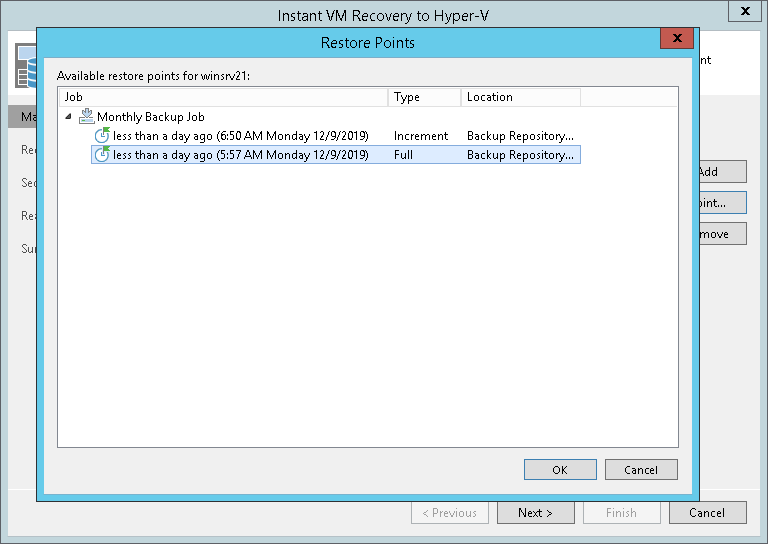 In the Restore Points window, select a restore point from which you want to recover the machine. In the Location column, you can view a name of a backup repository or object storage repository where a restore point resides.